No. 88, Jalan Mutiara Emas 7/5, Taman Mount Austin, 81100 Johor Bahru, Johor, Malaysia. 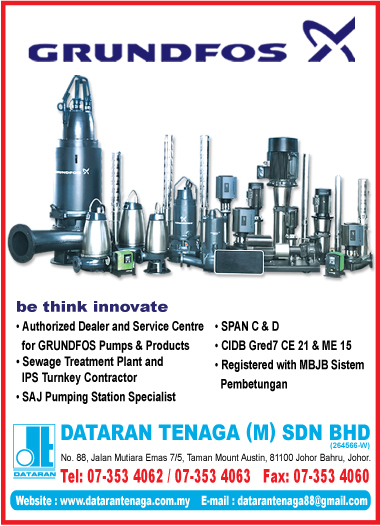 Dataran Tenaga was established in 1993 as one of the pioneer companies in Malaysia for pump supplier and water / sewerage works turnkey contractor. With our own professional sales team & project team for at least 10 over years experiences. Beside the above mentioned, we also have our own maintenance team with vast experience & expertise our technical services support team to perform repairs and trouble shooting to service your need. Solutions to fluid handling problems by offering well designed, correctly applied products & system, tailored to meet customers individual needs and supported by efficient after sales service.